The full story of the band, their key concerts and all their recordings. All accompanied by photographs and rare memorabilia. Spawned in the intensely fertile music scene that blossomed in and around Seattle in the late 1980s, Nirvana instantly distinguished itself by virtue of the singular passion - Kurt Cobain. Few were prepared for worldwide Nirvana-mania set off by the 1991 release of Nevermind. With the instantaneous success of 'Smells Like Teen Spirit', which stormed the charts. In Utero, was the last studio recording released by Nirvana. The demons that made Cobain's writing so powerful took their toll; he took his own life after only five albums. 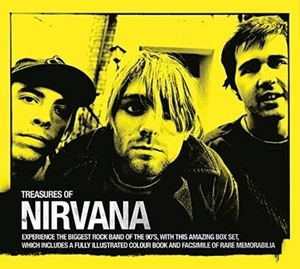 Nirvana's influence is certain to be felt for many years to come. The unique status this band occupies, as representatives of the time and as timeless songwriters, is revealed through interviews with those close to the band, coupled with intensive archive research. More Tales Of A Rock Star's Daughter by Nettie Baker.